NOTICE: This product is VOC compliant and available at ALL quantities to consumers in AZ (Maricopa County), CA, CT, DE, IL, IN, MA, MD, ME, NH, NJ, NY, OH, PA, RI, VA (Northern), VT, Washington, D.C., and Canada. TSS600 is an industry proven consolidation treatment for natural and masonry that has deteriorated due to weathering and subjection to extreme elements. It is a ready to use, deep penetrating sealant that strengthens, stabilized, and densifies surfaces upon which it is applies. In addition to shoring up decaying masonry, TSS600 is an excellent pre-treatment for surfaces before cleaning or patching, and can effectively reducing or preventing salt water corrosion. What is TSS Pro-600 Densifier Consolidator? TSS Pro-600 Densifier Consolidator is a specially designed cross-linking silane product that is intended to naturally stabilize and strengthen crumbling stone, seal and strengthen stone pool coping, sandstone, and other soft or damaged natural stone surfaces. It works by penetrating beneath the stone surface. In fact, TSS Pro-600 can penetrate beneath the surface of stone and into cracks, crevices, and weak points up to 10 inches deep! When used properly, TSS Pro-600 Densifier Consolidator sealant can stop stone erosion and halt further damage. 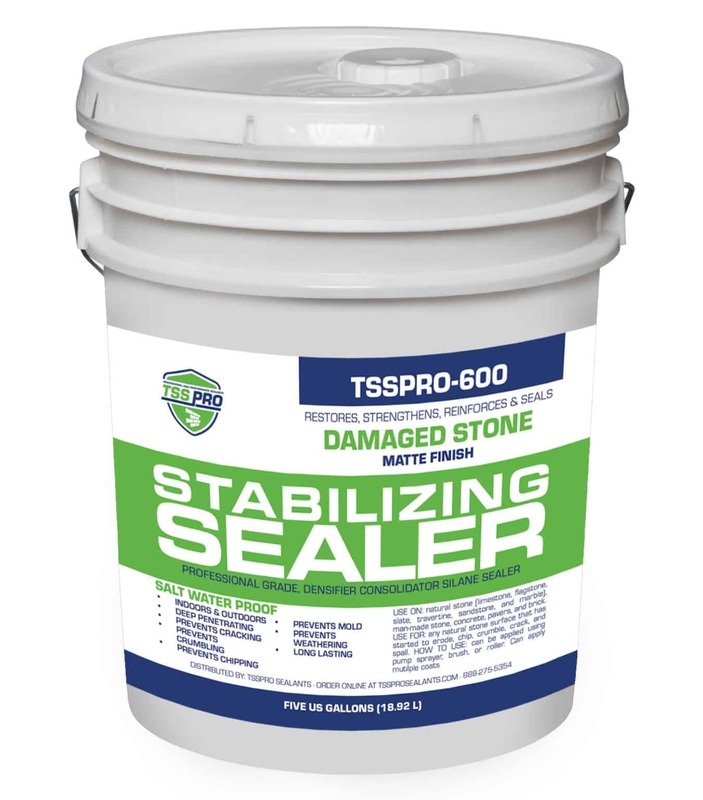 How Do Stone Densifying Sealers Like TSS Pro-600 Stabilize & Strengthen Crumbling Stone? The unique silane stone sealant formula combines traditional stone sealant compounds with powerful adhesives, naturally replacing the stone?s binding materials that have been lost over time. How does this work? Here?s an example: Imagine that your concrete garage floor was covered in cracks and eroding in spots because the builder used a bad mix. You want to stop the erosion from continuing by evening the surface and holding it in place. If you poured TSS Pro-600 stabilizing sealer over the cracked, crumbling surface and let it slowly creep out, seeping into every crack and crevice as deep as it can go, then you would have smoother flat surface after it cures. TSS Pro-600 stone densifier sealer works the same on stone, only it’s applied a little more carefully with a roller or brush. You may want to increase the number of coats you apply to the damaged stone, depending on how fragile and crumbled it is. What Type of Stone Damage Can TSS Pro-600 Prevent? What Type of Stone Can TSS Pro-600 Densifier Sealant Help Stabilize & Protect? One of the major benefits that TSS Pro-600 Densifier Consolidator brings to the table comes by way of its natural versatility. Simply put, it is ideal for ANY natural stone, concrete, brick or other man made surface that you’re having problems with. And many more patio, pool coping, fireplace, countertop, and flooring surfaces. If you would like to see whether TSS Pro-600 can be used to protect a particular surface not mentioned here, give us a call or send us an email. We?d be happy to answer any questions you have. It doesn?t matter how large the area that needs stabilization is or how old the stone or concrete building materials actually are. TSS Pro-600 can penetrate up to ten solid inches and will help not only restore crumbled stone and stabilize concrete erosion, but reinforce it to help make sure you don?t have to worry about these types of problems again. How is TSS Pro-600 Densifier Consolidator Applied? TSS Pro-600 Densifier Consolidator is typically applied using either a brush, a pump sprayer or a roller. This will vary depending on a number of factors, including how comfortable you are with these types of methods, the specific issues you’re experiencing with your concrete or stone surface and (as always) your own personal preference. Even though TSS Pro-600 Densifier Consolidator is incredibly easy to apply, you will still likely want to consult the help of our professional stone maintenance and sealing company to help make sure everything moves along properly. When you’re dealing with crumbled and damaged stone, one small mistake could turn into a much bigger (and more expensive) problem down the road. Our stone sealing and maintenance professionals will help make sure that you don?t have a thing to worry about, letting your concrete or stone surface truly shine once again. Why YOU Should Choose TSS Pro-600 Densifier Consolidator For Your Next Project? You can?t stop mother nature, but you can restore damaged stone and stabilize it to prevent future erosion when you apply TSS Pro-600. Why pay tens of thousands of dollars to you’re your pool coping refaced, your stone patio remodeled, or your countertops replaced if you can stabilize and restore them with a densifying stone sealant? When you ARE combating problems like deterioration, decay, salt water erosion and more, TSS Pro-600 Densifier Consolidator will always be by your side to help restore crumbled and damaged stone and to help significantly prolong stone life.